I remember growing up. Lent was a big deal. We would get our ashes on Ash Wednesday, Capirotada every Friday, and misa (or mass) on Sundays. I’m not as observant anymore, but I try to keep my culture alive for my son. He may be a redhead with green eyes, but he also speaks Spanish and he loves his Frijoles Picantes Pero No Tanto, or Not So Spicy Beans. My husband, Christopher, lived most of life on the East Coast. His idea of comfort food is totally, completely different from mine. Pork and beans in a can is not very Lent friendly. He’s a Pisces, and he still feels like a fish out of water when I take him to mass. 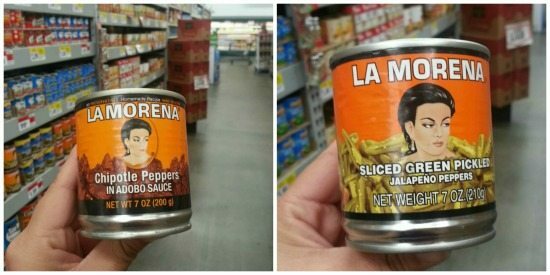 🙂 We picked up a can of La Morena Jalapeños for my Not So Spicy Beans. They are perfect for Lent since they’re vegetarian. The food we make in Mexico during Lent is delicious. We make several fish dishes like Pescado a la Veracruzana and Caldo de Camarón. People can get very creative during this time of the year. These Not So Spicy Beans remind me of my mom. She made his dish a lot during Lent. Her kitchen was the true taste of Mexico, and this recipe is a perfect example. I call them “Not So Spicy Beans” because you can add as little or as many jalapeños as you like. You can even just leave a slice of jalapeño in the bowl for the flavor without eating it, and it’s still tasty. Very easy to make and full of yummy flavors. Enjoy! An easy vegetarian dish that's tasty, filling, and full of rich Mexican flavors. Enjoy! Put everything into a large pot and let simmer for 15 minutes. 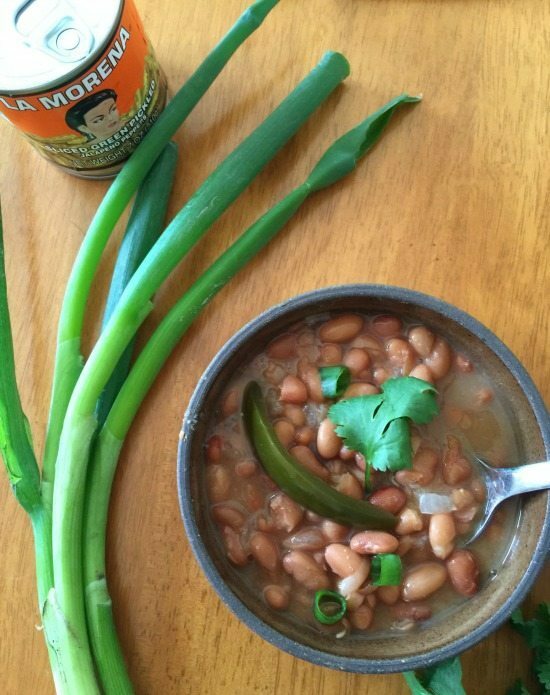 Serve into a bowl and top with jalapeños, green onions, if using. I’ve shared my holiday traditions with you. I’d love to hear about yours! Leave a comment sharing your family traditions. This looks delicious, Mama Maggie. Easy to follow recipe. When I was growing up Lent was a big deal too, I’m trying to make it a big deal for my son so that he knows what it’s all about. I love this recipe and it’s perfect for Lent. This looks delicious and such an easy recipe! Thank you for sharing. It is easy, and DELICIOUS! Thanks for your comment. 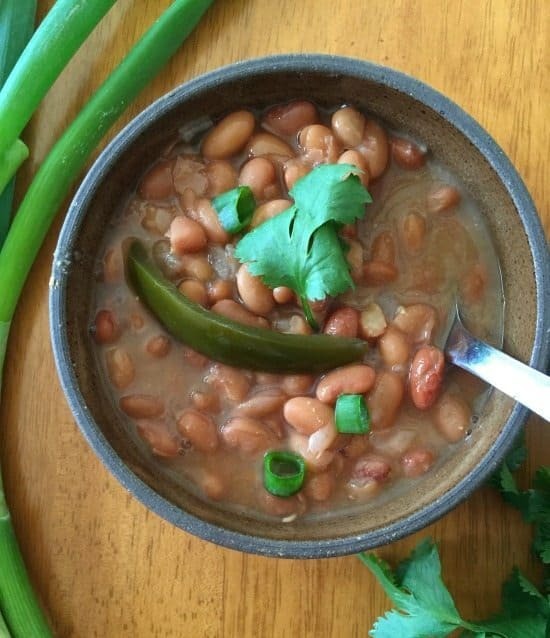 Simple and flavorful recipe, which I prefer over spicy! This is a great dish for Lent. I think so too. Thank you! Growing up, Lent was a big deal in my family too. I lived in New Orleans and we enjoyed big seafood dinners on Fridays which was never much of a sacrifice for us. 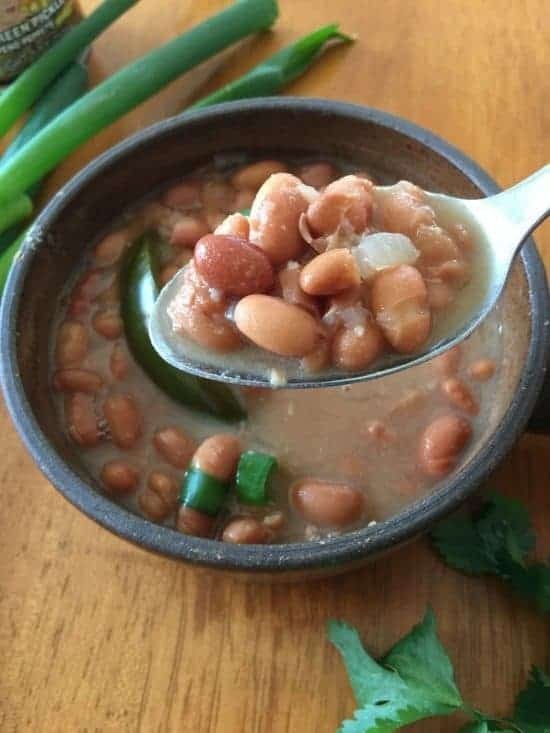 These beans look fantastic and I love that they’re not too spicy. I COOK MY BEANS IN MY CROCKPOT. 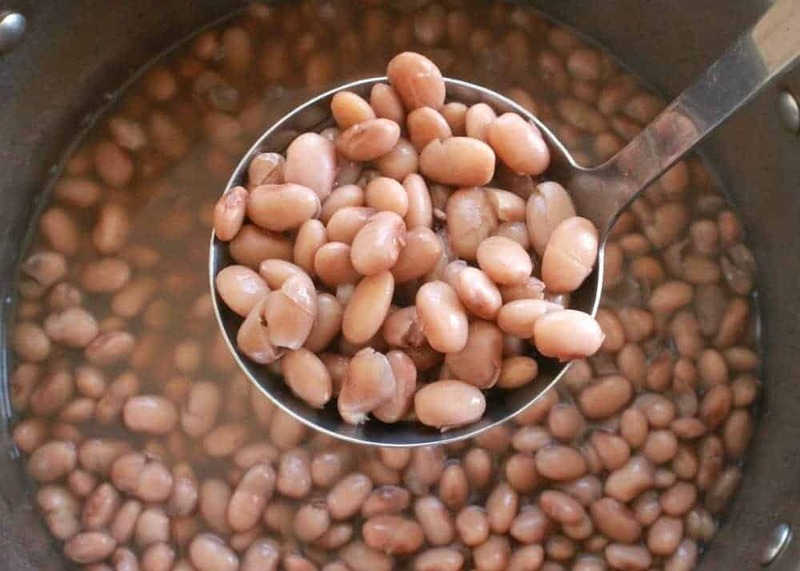 WASH DRY BEANS, SORT BAD ONES. PUT IN CROCK, COVER WITH WATER, LOW TEMP OVERNIGHT. NO SEASONING AT ALL. BEANS WILL BE TOUGH IF YOU DO. ANY DRY BEAN WILL WORK THIS WAY. THEY WILL BE DONE IN THE AM. I SAVE THE BROTH FOR SOUP. I HAVE DONE IT THIS WAY FOR YEARS. Yes! That’s a great way to make them.